Does fault current effect how live line work is carried out as it increases? 25kv overhead distribution is what I have in mind. The only thing fault current would affect is the incident energy. This would determine what level the arc rated PPE should be. This analysis should have already been done to meet OSHA 1910.269 requirements for an arc flash assessment. It hasn't been done yet because the current is 10ka, so its like any other live line work, however there are changes at the substation being debated that may bring it up to 20ka. Work changes will be part of the debate as to considering whether the increase is worth the disadvantages. So, you would have to see what 20kA does for the incident energy levels. Quite a bit of distribution gear is only rated for 10 kA, so increasing the fault levels to 20 kA might mean a large change in the equipment itself. One specific change may be adding fault current limiters when closing into transformers. Yes, but to be honest I don't know what to with the final results. Never considered arc flash outside of indoor switch-gear which I would imagine is very different as apposed to the open air environment. What do you mean by "don't know what to do with the final results"? Even if I get a cal per centimeter, I don't know how that applies to overhead work. I think the big thing is spacing. There was a utility I worked for that used more compact spacing in a section of transmission that they had narrower right away. OSHA has statements on working around live conductors and required spacing. The standard spacing for the utility was enough to assume OSHA's conservative values but not for their compact arrangement on a narrow section of right away. The company contracted out the study work to a consulting company and the consulting company did their study but still recommended against it due to an IEEE recommendation. The utility hoped the consultant would give them the green light so that they would be off the hook and no longer responsible. The study then went to EPRI and EPRI did so complicated study that justified that the field workers could work near the live conductors. All this because they didn't want to shut down the circuit for maintenance. For the overhead conductors, I think the arc flash calcs or something have to be different because you are not in a confined space. My thinking also, I know for example overhead buswork in a station can be treated without a bear suite despite having 63,000 amps of fault current. See Table 410-2 in the 2017 NESC (IEEE C2). @Stevenal, your help is an under statement- thank you! Is there ever a time when I have to consider a phase-phase event or just assume L-G for PPE in all cases? Side question for anyone who knows, why does distribution table stop at 20ka and the transmission stop at 50ka? I know of 80ka 230kv lines, this means that anything over 50ka should never be bare handed? Mbrooke, the NESC table was once upon a time based on ArcPro's results, likely is still but I haven't compared 2012 to 2017. We utilize 2 custom variants of a similar formatted table, one for LG work, and one for 3 phase work. The question that has came up and we still can't answer however is what coverup does on a three phase job site. Does covering up the other phases make it OK to treat the work as single-phase equivalent? We still treat 3 phase with coverup as 3 phase PPE requirements. As for the table stopping, I'm betting they just took a handful of values they felt were applicable to the majority of utilities and ran the numbers on them to provide a starting point. By how much does your 3 phase table differ with the single phase table? Personally I'm with you, I want to treat covered 3 phase as having the potential to flash phase to phase. 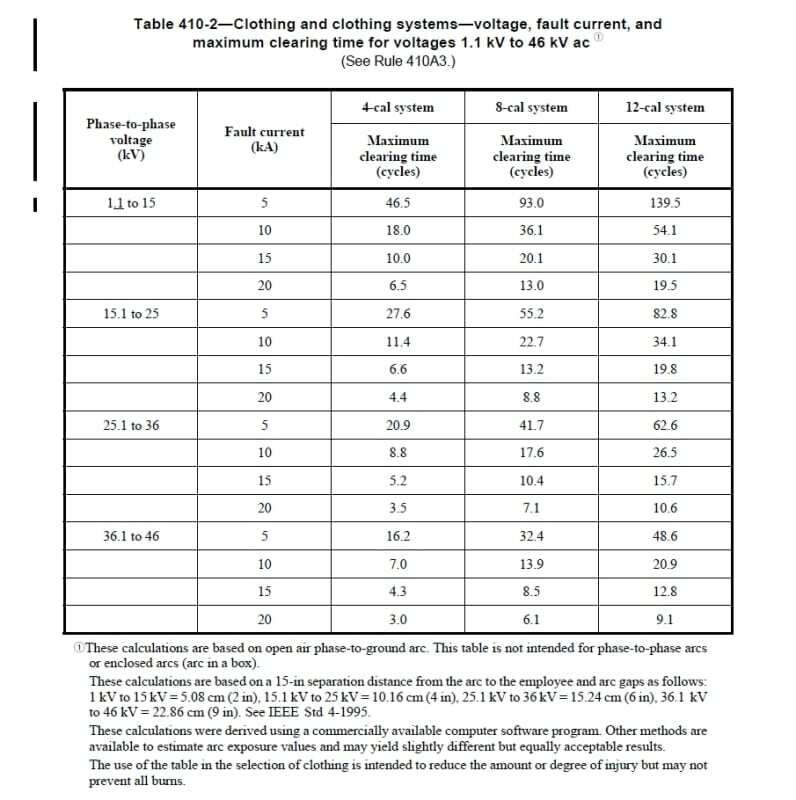 I can't see the table but it is wrong to assume that you'll have more arc flash energy or be required to have a higher rated PPE if you have more or less fault current. The total energy released is going to be (clearing time) x I^2*R. A high impedance fault that is hard to detect or takes a while to clear out can be the worst. Regarding phase to phase faults - ArcPro had a multiplier of 1.5 for phase to phase faults over phase to ground, and 2.2 for three-phase. Not sure how this compares with reality. But you could over this in your work orders when applicable if you're concerned. HamburgerHelper: The table lists fault currents (5k, 10k, 15k, etc) and maximum clearing times allowed to obtain a 4, 8, 12 cal system. Mbrooke: Our table has differences because the inputs into ArcPro differ for single-phase and three-phase arc flash. The arc gap ends up larger for three phase compared to single phase and is comparable to the method I believe NESC utilized to calculate the gap (single-phase: VLL/sqrt(3)*3*0.1, three-phase: VLL*3*0.1, the "3" is OSHA's 1910.269 App B transient overvoltage multiplier). For results on our 24.9 system at 10 cycle clearing, 3kA maximum fault current, and 15" working distance, we end up with single-phase of 0.8 cal and three phase of 2.7 cal. These were all done before IEEE 1584-2018 and ArcPro v3.0 so I'm not sure how the new standard and software (ArcPro has single & three phase modes now) will end up altering our numbers yet.